November! Honestly what happened to October and a good part of September?? When I saw this week's sketch from AHSC I knew I had to use the gold striped paper found in the Silver & Gold Paper Packet, what made it even better was the dotted zip strip! 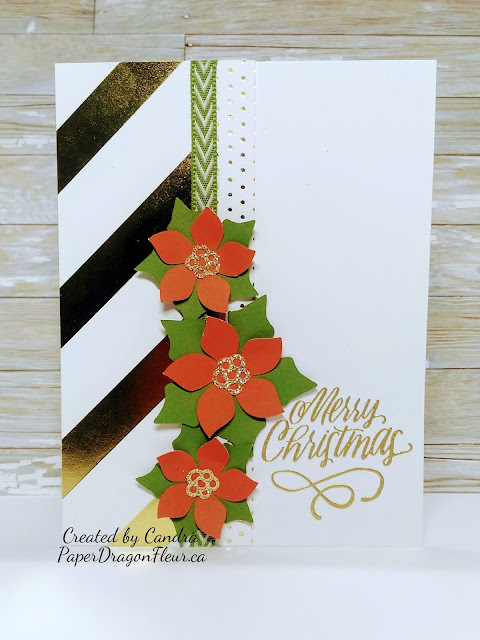 The poinsettias are from Cricut Flower Market and I used Cranberry and Topiary (a retired colour) cardstock and the centers are cut out on Gold Glitter Paper. The Merry Christmas sentiment is a retired M-size stamp from last year and I heat embossed it with gold embossing powder. This card is all about the Gold! The final touch is a piece of Topiary ribbon from my stash, gotta love the stash. I love the clean simplicity of this card. Thank you for stopping by and I truly appreciate your comments! I hope I have inspired you to come play along with us at Atlantic Hearts Sketch Challenge.